We understand your business demands. We make it work. Expect commitment, professionalism and results on assignments of any magnitude. With a client base of some of the most respected organizations in the country, we provide customized, value-based talent management solutions. E. K. Ward & Associates provides consulting on a wide range of human resources and talent management issues. Whether you need on-the-ground support for major turnaround and performance improvement initiatives, or simply best practice expertise, we translate your challenge into a practical and sustainable solution. A long history of serving many of local and national companies means we really understand the unique business challenges companies face better than most consultancies. 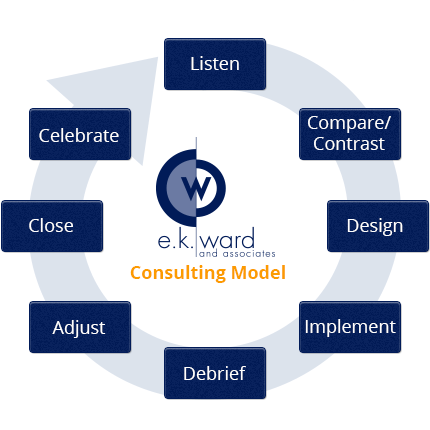 At E. K. Ward & Associates, we understand that every company we work with is different. So we start out by asking questions and listening. As your thought partner, we work with you to create a shared vision of the future. Only when we fully understand your needs and challenges, do we make recommendations for results-oriented solutions that are practical and realistic for your business world. Regardless of project size, we apply our proven Consulting Model to determine and deliver the best services to achieve your goals while keeping your company running efficiently and profitably. Explore our capabilities to learn more about what we can do for you. E. K. Ward & Associates (EKW&A) is a national human resources consulting company that provides value-added talent management solutions to today's businesses. We understand that your workforce is critical to your success. So we work hard to understand your organization's unique needs and culture to deliver the best answers to your talent management questions and challenges. Founded in 1991 as an HR consulting firm in the Buffalo, New York area, EKW&A was created in response to a growing need for organizations to manage employee outplacement and to identify hard-to-find talent through professional search. Today, we use our proven experience to help businesses leverage and extend their existing expertise to maximize their organization's talent and achieve their goals.